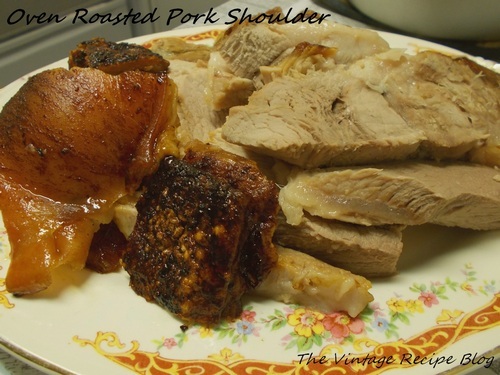 Roasted pork has been around ever since we started killing wild boars in the forest in the dim beginnings of humanity so in that sense this is a "vintage" recipe but for our purposes here this recipe is all my own. It is based on a Filipino recipe called Lechon sa Hurno which translates into "roasted in the oven". It's a home based version of the popular party centerpiece Lechon Baboy or roasted pig where a whole pig is gutted and roasted for hours on a spit over an open fire. This is your classic Sunday roast pork or as the British call it a "Joint With Crackings". It's the type of meal made at the beginning of the week where the leftovers can be put to many uses through the rest of the week. The type of meat used in this recipe is alternately referred to as Pork Shoulder or Fresh Picnic Ham. It comes from the back leg of the pig as opposed to the foreleg where traditional hams come from. There are smoked versions of picnic hams and I've used this recipe with them before to great success but the flavor is not what we think of as "ham", it's smoked pork. Now the biggest thing this recipe needs is time and lots of it. You'll be slow roasting a piece of pork weighing between 4-6lbs with an increase in oven temperature to get the skin really crisp. There isn't alot of seasoning to this recipe, I've made it before stuffed with garlic cloves and lemongrass or garlic and rosemary but I really prefer to let the pork stand on it's own with a good sauce. Wash the pork well and blot off excess water with paper towels. Rub well with salt and place uncovered in refrigerator for 1 hour. Preheat oven to 450° and place pork on rack in roasting pan. Place in oven rack at middle position and roast about 30 mins until skin starts to puff up and look like it's turning to crackings. Reduce heat to 325° and loosely cover pork with tinfoil and continue to roast for 30 mins per pound. Remove tinfoil and baste meat and skin with drippings and roast another hour basting every 15 mins. The meat should be fall apart tender and the skin should be extra crisp. Remove from oven and let sit covered in foil 5-10 mins. To serve, remove the skin and chop into serving pieces. Cut off slices of pork and arrange with skin on serving platter. Serve with Spanish Sauce, Roasted Potatoes and Vegetable of choice.